In a deep slumber for many years, pushed from one place to another, misused as a store and defaced with graffiti: that is the recent history of trailer 197 805. 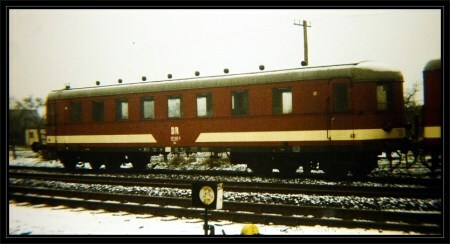 Designed by the firm WUMAG in Görlitz as a lightweight four-axle trailer car for the German State Railway company's diesel-mechanical railcars, 197 805-5 was constructed in Uerdingen. Originally given the number VB 147 027, the car was first put into service from Seddin depot. Throughout the Second World War and for most of its time in service with the GDR state railway, the car was based in Berlin and Brandenburg depots. Frankfurt (Oder) and Templin were two of the depots where it spent several years and there are also photographs of it in service on the Island of Usedom. 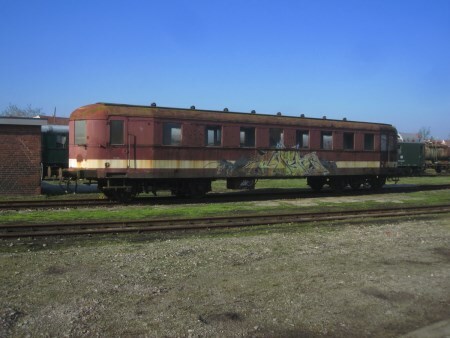 After its service came to an end, it was parked in the depot at Jerichow and the picture Rainer Hünecke has kindly made available to us shows the car in Jerichow in the 1980s. In 1987, the car was handed over into the care of the 7/64 Salzwedel group of the GDR's German Model Railway Association and was later passed into the care of the Dampflokfreunde Salzwedel. It is intended to restore it to working order as it was last running – a task which will undoubtedly take a good deal of time. An initial examination has demonstrated that its material condition justifies a return to working order. Its external condition is admittedly deplorable, but the car body, the floor and the running gear show astonishingly few traces of rust. The same applies to the interior fittings: since the roof is still largely watertight, these have also suffered minimally. The interior has been completely gutted and current photographs show the condition inside as it was on 24.1.2015. When further progress has been made on the work, we shall be consulting with the responsible supervisory authority to make a decision on whether the car will be – or indeed can be – restored to full working order. Account holder: Dampflokfreunde Salzwedel e.V. Dieses historische Foto des Wagens wurde uns von Rainer Hünecke zur Verfügung gestellt.